Construction projects are always messy, and the aftermath requires a very specialized cleanup process that the construction company themselves don’t provide. Sure, they’ll pick up their tools and the odd bit of trash and give you a basic cleanup job after they’re done, but there are always stains, leftover materials, and signs of building work left behind. If you’re like most homeowners, you might just try to clean this mess up yourself, but that’s actually not always a good idea. Construction projects can leave behind materials that require special cleaning materials, safety processes and skills in order to be cleaned properly, and trying to do it yourself can cause more trouble than it’s worth. 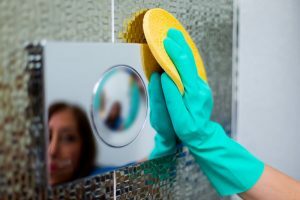 Let’s look at how you can get your home back to its former glory by hiring a commercial and residential cleaning service. There are laws regarding the disposal of many construction materials which the average person is unaware of. It might seem like a small thing, but breaking these laws can lead to a fine, or worse. Rather than risk putting yourself in hot water, it’s much safer to hire a commercial and residential cleaning service. Cleaning up after construction is not like doing a simple spring clean of your house. It can require time and effort that you simply don’t have. Instead of wasting your time trying to get it done yourself with insufficient tools and cleaning products, it’s much smarter to hire a commercial and residential cleaning service to do the work for you. Not only do they have the manpower the job needs, but they also have the experience and expertise to allow them to get it done significantly faster and, most importantly, more safely than if you and your family were to do it. A construction project can leave your house in all kinds of disarray. All you want to do is enjoy your new terrace or master bedroom, but you’re stuck with a mess that you’re unequipped to handle. Hiring a commercial and residential cleaning service like Naps Maintenance Service Inc. can be just the right move to save you vast amounts of time, energy, and risk of fines or injury. Leave it to the professionals. 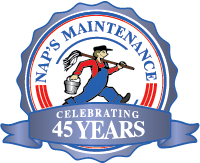 Call a commercial cleaning service like Naps, and get your house spectacularly cleaned.